Areolar connective tissue is loose irregular connective tissue. There are fibers oriented in all directions and cells interspersed in abundant matrix. Some of the fibers are thick and some are thin. The collagen fibers are thicker than the elastic fibers. 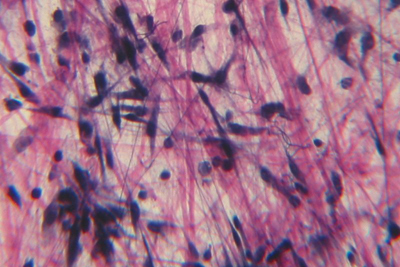 The elastic fibers stain more darkly purple. Open spaces in the matrix are seen. Histology slides courtesy of Mt. Hood Community College.